Infants: 0-2 yrs old. $30. Includes baby chair. Children: 3-10 yrs old. $100 USD. This excursion departs from San Jose very early in the morning en route to Puntarenas, where you will board a yacht to Tortuga (Turtle Island), a beautiful island located in the Gulf of Nicoya. sunbathe, and/or take an optional tour like kayaking or canopy. Then a delicious lunch will be prepared by the crew. Tortuga Island is composed of 120 hectares of gorgeous terrain, with 4 main hills; not to mention a 500 meter beach which is a recipient of the blue flag certification. 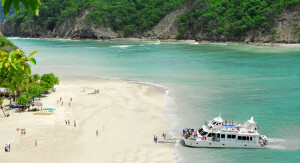 On the way to Tortuga Island you will see the San Lucas Island which in the past was a security prison where no human rights existed and thus a dark age in Costa Rica´s history. 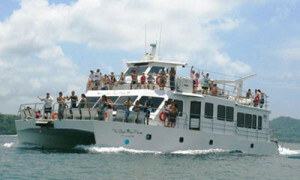 The journey to Tortuga Island will be on board a yacht equipped with 2 Cummins Marino 300 HP motors, radar, satellite navigation systems, VHF marine radio, clean bathrooms, and palatable drinking water. Bay Island is committed to not only provide you with an enjoyable and unforgettable journey but also a safe and secure trip. To that end, the yacht’s captain has more of 10 years of experience and possesses an international maritime license, and the crew is well trained for all types of emergency situations. Return details: Returns to original departure point at approximately 8:30pm.